I don't know how to share videos on here through my phone (which serves as my computer), but I believe the video is titled "The Mysterious Case of Elaine Nix"
I'm not sure, but I believe the symbolism behind water-related deaths is Their way of twisting, or mocking, religious folks and baptism. I could be wrong and am open to other theories. Still, Luciferians and Satanists do love twisting and mocking Abrahamic faiths, so why wouldn't they pervert baptism? Thy Unveiling wrote: I don't know how to share videos on here through my phone (which serves as my computer), but I believe the video is titled "The Mysterious Case of Elaine Nix"
It could be, though it seems unlikely to me. A more simple answer seems to me that holding someone under water long enough causes a ''clean'' death.. The trial was rushed and the 'perpetrator' maintained his innocence to the end. "the biggest story since the Resurrection." Legal scholars havet referred to the trial as one of the "trials of the century".The crime spurred Congress to pass the Federal Kidnapping Act, commonly called the "Lindbergh Law,"
kidnapping victim across state lines a federal crime." Among the many other interesting characters involved was "Wild Bill" or William Donovan, director of OSS (fore runner of the CIA). And the federal gov't got involved in a local case. To me, the whole thing comes across as a giant conspiracy, to what end, who knows???? No, you are right on. Just reading about it over at Wikipedia, alot of things don't add up and i haven't had the opportunity to read books on it. Time has a way of revealing truth. It seems as though they planned to kill their own child (and they succeded) but why? I don't buy the whole developmental disability thing. Lindy's hand was way too deep into the investigation. They could have shipped him to a relative in Sweden (Lindbergh Sr was swedish. He changed his name), Germany or Monaco and the case would have remained an unsolved one but the baby's corpse was found a few miles from their home. Was it the perfect distraction devised for the populace? What was politically going on at that time? Thanks for contributing to my topic both, I will delve into it later today. Am trying to wake up now..
Perhaps the baby served as a sacrifice of sorts, as many of the sensationalized (and tragic) cases of young kids going missing then turning up dead. Am going to miss seeing you around, Tara. a powerful hand at work. perpetrator, both trace to the Lindberghs’ enemies? assassinated — an incident still controversial. life before dying suddenly, also in 1936.
father-in-law, Dwight Morrow, now Republican Senator for New Jersey, was touted as a possible presidential candidate. Morrow returned home — and died that night. 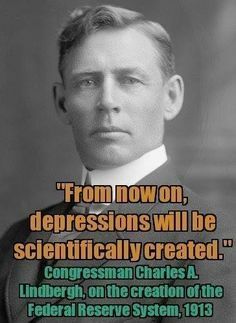 Thus vanished a remaining hope for the Republicans, whom newspapers blamed for the Depression. Lindbergh’s baby was murdered — effectively removing the grieving father from the political scene. Some of the links. vice-chairman, had designed. In 1917, Lindbergh tried to have Warburg, as well as FDR’s uncle Frederic Delano, impeached from the Federal Reserve Board. Committee, debated Lindbergh at Madison Square Garden, and publicly denounced him. kidnapping night: She was “out riding” with Red Johnsen — boyfriend of the baby’s nurse. a two-month trip to Europe. snatched it back and ran outside into a chauffeured sedan —which police unsuccessfully searched for. ordering the kidnapping cannot be proven.